Former Los Angeles Times national reporter McDermott (101 Theory Drive: A Neuroscientist's Quest for Memory, 2010, etc.) changes pace with a book about baseball focused on the craft of pitching. The author is an avid fan of the Seattle Mariners, so he constructs his taxonomy of pitching around the perfect game pitched by Mariners’ ace Félix Hernández on Aug. 15, 2012. In a variety of asides, the author relates how growing up in small-town Iowa offered the foundation for his romance with baseball. (The author opens with a mention of Field of Dreams.) The chapters often veer off into nostalgia, sometimes featuring searing insights into rural life during the 1950s and ’60s and other times coming off as trite. When McDermott focuses on Hernández’s perfect game, he provides an effective blow-by-blow account. The author relies on the box score from that day, news coverage of the game, and interviews with major leaguers, including Hernández himself. In the sections in which McDermott writes about the evolution of specific pitches—e.g., traditional fastball, two-seam fastball, four-seam fastball, cutter, curve, slider, knuckleball, changeup, sinker, screwball, forkball, and the now-illegal spitter (“a pitch to which a foreign substance has been applied, causing the pitch to drop suddenly as it approaches home plate”)—he also offers some brief digressions regarding baseball history in general. 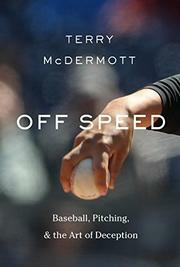 At times, McDermott makes pronouncements about the most talented pitchers that might be deemed controversial by some baseball scholars and fans—did Sandy Koufax throw the best fastball and the best curveball ever?—but the narrative is filled with passion and insight into how the game’s measured pace can seem both out of touch with fast-paced contemporary life and a temporary corrective to that fast pace. The book will likely bore or baffle those not already passionate about baseball, but it will please die-hard fans.